For all items that have prices, you can simply purchase them on-line via our new shopping cart system. When you "check out" you will be able to create an account. These items will all have free shipping as an incentive to use our new Shopping Cart! We have the highest level of SSL security offered through the internet, and your privacy is guaranteed. Simply go to My Account, create an account, and you can begin shopping. For items without prices, contact us for the price and additional information. PayPal: SSL secured PayPal ordering through PayPal's system is available for online shopping cart orders and is fast and easy to set up if you do not already have an account. Credit Cards: You may order by credit cards through PayPal's system on our Shopping Cart, or, during periods when our shopping cart is not accepting direct credit card payment you may contact us by phone (949)497-5747 or email (info@indianterritory.com) if you do not wish to use the PayPal system. Use the Artifact ID number (inventory #) on the object to identify the item to us. -Personal & Business CHECKS ARE ACCEPTED but cleared prior to shipping. Call us if you are making a special trip to Southern California … we might be able to meet you at the gallery after hours if you set up an appointment. For security purposes, it is considered a common internet precaution to split your credit card number over two emails if sending a credit card number by email. We will send you an order confirmation e-mail and e-mail you a UPS shipping tracking number that you may use to follow the progress of your order's shipment online at the UPS website. -Please include all contact and shipping information including phone and email. Unless otherwise specified by Indian Territory gallery in writing, internet customers may examine purchases for up to seven (7) days from customer's receipt of delivery (per UPS shipping records) and may place purchased item (s) in return shipment anytime in this seven day examination period for a full refund (minus shipping). Customers are responsible for purchasing shipping insurance at the full purchase price for any items to be returned. Upon delivery receipt, customers should immediately and carefully open shipment preserving ALL shipping materials (including any and all double boxing, all bubble wrap, all Styrofoam "peanuts" etc.) until customer determines that both a.) the item has not been damaged in shipment and b.) the customer is NOT returning purchased item (s). If item is found damaged from shipment, please retain ALL packing materials and call us at (800) 579-0860 or (949) 497-5747. We will arrange for UPS to pick up the damaged item from you in its original wrapping materials and upon verification with UPS, provide you with a refund. A professional document of authenticity on letterhead, suitable for insurance and archival purposes, is available upon request at the time of purchase. After shipment of item, documents are available for a modest fee--please e-mail or mail photos and measurements with your documentation request for a free quote on documentation services. We can also provide formal insurance appraisals on all North American Indian artifacts not purchased through our gallery. Please contact us for a free estimate. Navajo rug cleaning and restoration is available; please see our SERVICES section in this website for more details. 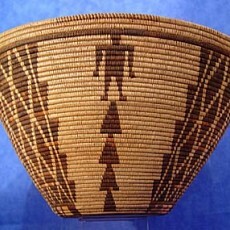 Basketry and pottery restoration services are also available.